(NaturalNews) Concerning documents that have recently come to light reveal drug firm schemes to maximize profits on medicine that is used to treat cancer, AIDS and heart conditions. 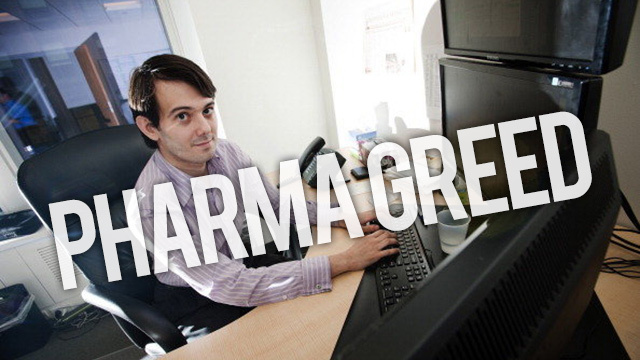 A congressional review of more than 300,000 pages from Turing Pharmaceuticals and Valeant Pharmaceuticals reveals how executives planned to maximize profits while fending off negative publicity over the price hikes. The two drugmakers have made a practice of buying and then dramatically hiking the prices of low-cost drugs given to patients with life-threatening conditions – according to excerpts from thousands of documents released by federal lawmakers. Rep. Elijah Cummings of the House Committee on Oversight and Government Reform released the information ahead of a hearing last week to examine the extortionate price spikes by several companies that have previously bought low-cost drugs and jacked up the prices. The Democrat said in a statement that the documents show "that many drug companies are lining their pockets at the expense of some of the most vulnerable families in our nation." At the heart of the investigation is Turing's former CEO Martin Shkreli who was in the press last fall for hiking the price of life-saving drug Daraprim by more than 5,000%. Daraprim is the only approved medicine for treating parasitic infections in patients with weakened immune systems – including those already suffering with cancer and AIDS. Company presentations have revealed that, as early as last May, Turing planned to turn Daraprim into a $200 million a year drug by dramatically increasing its price after purchasing the patent from Impax Laboratories in August. Shkreli wrote in one of the emails in question, "We raised the price from $1,700 per bottle to $75,000. Should be a very handsome investment for all of us." An internal memo was also sent around by the company: "HIV patient advocacy may react to price increase... HIV community is highly organized, sensitive and action-oriented." The price increase left some patients with co-pays as high as $16,000, according to the committee's review of more than 250,000 pages from Turing Pharmaceuticals. In addition to the review of Turing, the House committee has reviewed more than 75,000 pages of documents from Canadian drugmaker Valeant and found that CEO J. Michael Pearson took the decision to buy two life-saving heart drugs – Nitropress and Isuprel – in order to dramatically increase the prices and drive his company's revenue and profit. These two drugs are used to treat abnormal heart rhythms, congestive heart failure and high blood pressure. Valeant has tripled the prices for one and increased the other six-fold. A memo has revealed that Valeant first identified its revenue goals before then utilizing drug prices to reach those goals – believing it could repeatedly hike the prices of Isuprel and Nitropress without repercussions. These drugs have generated $547 million in revenue and approximately $351 million in profits last year alone. The memo also showed that Valeant had more than tripled the prices on more than 20 other U.S. products in 2014 and 2015. Both Valeant and Turing Pharmaceuticals commented that they are committed to ensuring that cost isn't a deterrent for patients. But with such outrageous increases on so many day-to-day drugs used by many Americans, it brings into questions how Big Pharma can get away with such price hikes – and what is being done to protect those who need medicine from future greed-fueled increases.